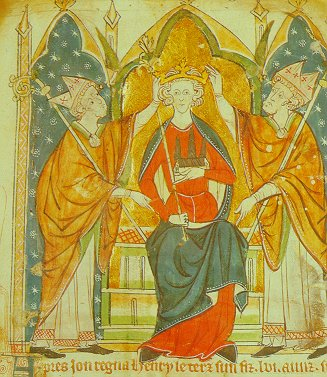 Henry III., King of England, eldest son of King John and Isabella of Angoulême, was born at Winchester in 1207. He succeeded his father in 1216 and was crowned at Gloucester, in the presence of Gualo, the papal legate, predecessor of Pandulf and one of the guardians of the young king, 28th October of that year. 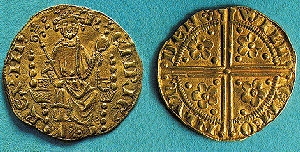 The regency was intrusted to William Marshal, Earl of Pembroke who in 1217 defeated the French army at Lincoln, and compelled the Dauphin Louis to retire to France. On Pembroke’s death, in May, 1219, Hubert de Burgh and Peter des Roches, Bishop of Winchester, became regents; but mutual jealousies and dissensions disturbed their administration and weakened their power. Henry was crowned a second time, in 1220, and two years later was declared of age, but his feebleness of character unfitted him to role, and the real power remained with his ministers. Henry’s fondness for foreign counsellors, his unsuccessful wars with France, and his attempts to govern without parliaments, excited much ill-humour in the nation. This was increased by the papal exactions which he permitted, and by the heavy impositions on his subjects, made necessary by his acceptance of the crown of Sicily for his son Edmund. At length, in 1258, he was virtually deposed by the ‘Mad Parliament,’ which assembled at Oxford, and a council of state was formed under the presidency of Simon de Montfort. The popular leaders quarrelled among themselves, while the king was a prisoner in their hands. But in 1262 civil war began, the king being compelled to employ foreign mercenaries. In 1264 the battle of Lewes was fought, at which the king, Prince Edward, Earl Richard, King of the Romans, and his son Henry, were made prisoners by the barons. Soon after De Montfort, now virtually sovereign, summoned a parliament, which met in January, 1265, and was the first to which knights of the shire and representatives of cities and boroughs were called; thus constituting the first House of Commons. Prince Edward managed to escape and amassed a royal force to confront Montfort. In August of that year De Montfort was defeated and killed by Prince Edward at the battle of Evesham, and the king regained his liberty. But the war lasted two years longer. In 1270 Prince Edward set out on the crusade, and before his return Henry died at Westminster, November 16,1272.